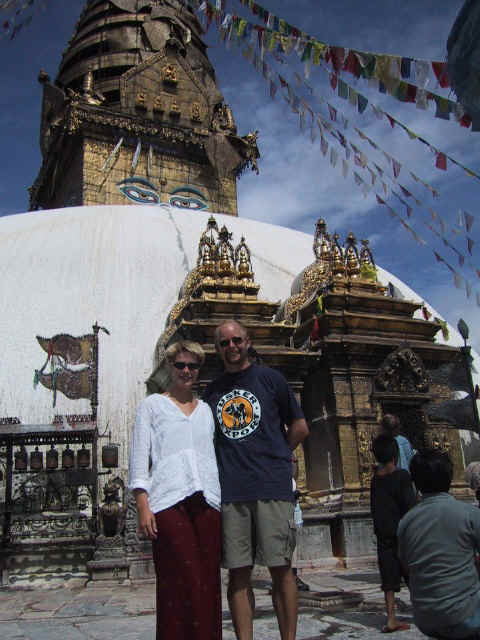 This morning we met the group at 8:00 for a tour of Kathmandu’s major sights with a local guide. Last night it rained pretty hard, so the streets were very muddy and wet. Regardless, we set out for the 2km walk to Swayambhunath. 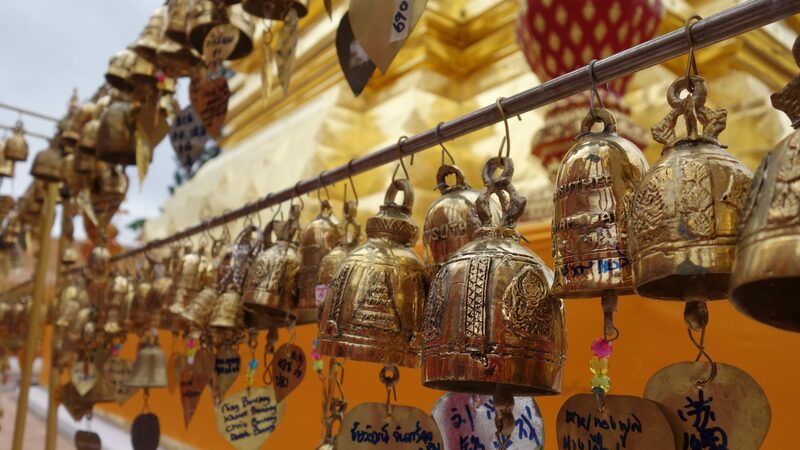 Swayambhunath is the Buddhist temple also known as the Monkey Temple because of all the monkeys that live there. The temple is very large and is situated on top a hill west of the city. We can see it from our hotel room window. It took us about 20 minutes to get to the temple, but mostly because we had to walk up 365 very steep steps. Our guide told us that there are 365 steps because – for pilgrims – this is one for every day of the year and helps in the purification process before reaching the temple. I commented that it’s good because I need all the purification I can get. Needless to say, I wasn’t saying much at all when we finally reached the top because I was so out of breath and so incredibly hot! But the view from the temple was incredible and we all just stopped and stared for a while while our guide told us about it’s history. No one really knows when it was built, but there’s evidence that it’s been here for 2000 years. The stupa is a dome-shaped structure topped by a gold-colored block with Buddha eyes. Around the base of the stupa is a number of prayer wheels which pilgrims spin as they pass by. It’s important that the wheels be spun in only a clock-wise direction, and we were told to walk around the temple in only a clock-wise direction as well. I never really asked why, but sometimes you just accept these traditions and go with them. The flags are prayer flags with various mantras on them. It’s said that – when the wind blows – the words are dispersed into the air and prayers are granted. 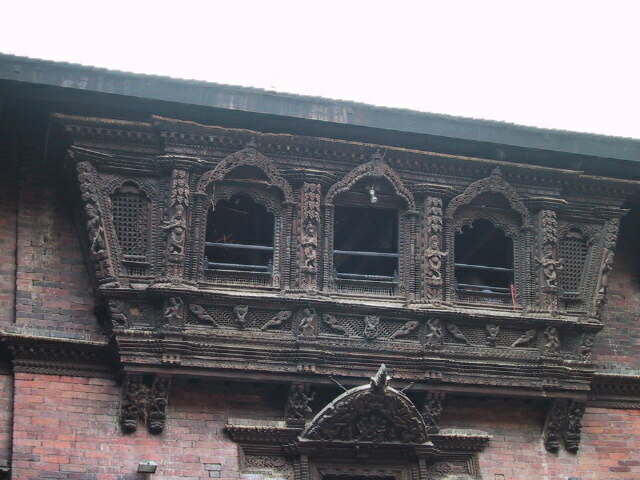 In Nepali, Durbar means ‘palace’ and although the King no longer lives in the old palace, the temples are still clustered around the square and it is still the center of Kathmandu. Our guide took us around and showed us many different buildings here. We saw the Kasthamandap – also known as the House of Wood. Legend has it that the entire building was made from a single sal tree, but I’m a bit skeptical about this as it’s a huge building. While we were there, an adorable child wandered up to us looking for chocolate which none of us had. So Ken started to play with her instead. He played the “lifting game” where he lifted her high up in the air or swung her by her arms and she would giggle uncontrollably. It was so cute! We also saw the Shiva Temple and – today being Monday – it was quite crowded with women worshippers. I can’t remember if I’ve previously described Shiva, but he is the Creator and the Destoyer, and is probably one of the most important Gods in Hindu. He is known as Mahadev, the Great God. His shakti is Parvati, or the Great Goddess (Mahadevi). Apparently, Shiva is very good to his Goddess and many Hindu women aspire to make their men as good as Shiva. So this is why the Shiva temple is crowded with women today, because they are making him offerings to bring good luck to their husbands and to have some Shiva-ness rub off on them. So Shiva is quite the stud muffin. Also in Durbar Square, the most interesting part of the day was a visit to the Kumari Bahal to visit the Kumari Devi – Nepal’s living goddess. She is a newly selected Goddess as of two months ago and is only 4 years old. She can come to the window once a day to look out into her courtyard. So we went into the courtyard and looked up at the window and waited for her to appear. We were not allowed to take photos of her, but we could take pictures of the window and the courtyard, which is actually beautiful in and of itself because all the carvings are entirely of wood. We didn’t have to wait long for her to arrive, and she suddenly appeared out of nowhere. She was wearing a yellow silk jacket and had a red good-luck mark on her forehead. We clapped for her as soon as we saw her. Then, five seconds later, she was gone. She didn’t look very happy for someone who was recently named a Goddess, but I guess she may not fully understand what all the hubbub is about. I think Jon should make me a living Goddess. I think I’d be good at it. And I wouldn’t let it go to my head. Really. After touring Durbar Square, the group dispersed and everyone went their own ways. Jon and I caught a rickshaw back to the hotel because I was feeling the effects of the heat and needed to sleep for a while. He hit the town for lunch and ran some errands before we take off for Tibet tomorrow. Later, we met everyone in the lobby at 7:00 for dinner and went to a place called Alice’s Restaurant (Arlo Guthrie, anyone?). The food was quite good and it was nice to hang out with the group and to get to know everyone. We have to be up early tomorrow, so we didn’t stay out late.